Keeping your data safe and in sync across multiple machines usually requires two separate applications: a backup tool and a file synchronization solution. But with SpiderOak  you can take care of both tasks using one neat service and client software combo. In addition, SpiderOak allows you to share files with other users, which makes it a great one-stop solution for all your backup and sharing needs (Figure 1). But that's not all. The service keeps track of all changes made to files or documents, and you can access easily any previous version of a specific file. This effectively turns SpiderOak into a rather nifty versioning solution. 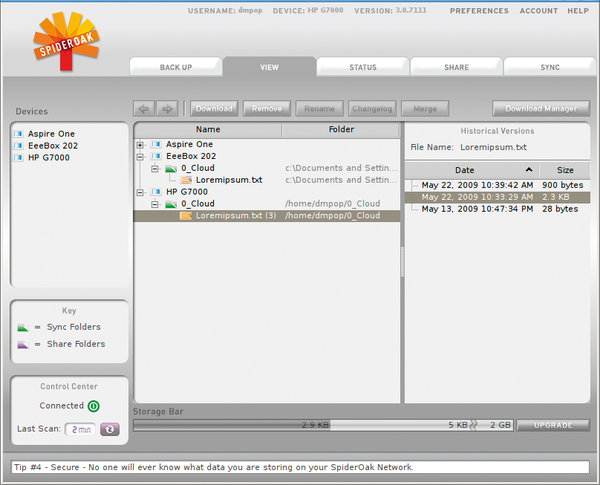 Figure 1: SpiderOak client allows you to configure backup, share, and synchronization settings. Better yet, even if you delete a file from your local machine, SpiderOak saves it on the server, so you can always restore it if needed. Using SpiderOak's web-based interface, you can access your backed up data from any machine, which can come in handy when you are on the move. SpiderOak also makes a good choice for security-conscious users: Every account has its own unique encrypted key, and your data is encrypted not only during the upload and download process, but also on SpiderOak's servers. These SpiderOak features are just a few to whet your appetite. If you are hungry for more, read on. To get started with SpiderOak, you have to create an account. The company offers both free and paid plans. The free plan gives you 2GB of storage, whereas the paid plan will cost you $10 per 100GB, meaning you can buy as much storage space as you need. Also, you'll get a discount if you pay a full-year subscription. Generally, you might want to start with a free account, and if you like the service, you can upgrade at any time. Next, you should download and install the SpiderOak client software. SpiderOak provides packages for a wide range of platforms and Linux distributions, including the latest releases of Debian, Fedora, and Ubuntu. First, download the appropriate package and install it with your distro's package management tool. On Debian and Ubuntu, you can do this by running the dpkg -i command as root. Once the client software is installed, launch it, and use the setup wizard to configure the client and link your machine to your SpiderOak account. Now you can link an unlimited number of machines to your account, and you can even share your account with other users. This makes SpiderOak not only a nifty personal backup and synchronization tool, but also a great collaboration solution. For example, you can create a SpiderOak account for your workgroup and then use the service to exchange files and documents between workgroup members, track changes, and back up the project data. When the client is up and running, you have to specify the directories you want to back up and configure the backup settings. This step is important, not only because you want to keep your data safe, but also because you can't use synchronization and sharing features without backing up directories first. In other words, if you want to keep the contents of a specific directory in sync across multiple machines or share it with the world, you must add this directory to the backup profile. Adding directories to the backup profile is easy. In the SpiderOak client, switch to the Backup section and tick the directories you want to back up. Alternatively, you can use the Categories pane to select all directories belonging to one of the available categories. For example, ticking the Music category adds the default music directory to the backup profile. If you need to locate a specific directory or file on your hard drive quickly, you can use the Search field. Also, you can back up hidden directories by pressing the Hidden Folders/Files button to view and select them. The Preferences menu item at the top-right corner of SpiderOak's interface lets you tweak other backup settings (Figure 2). In the Backup section, you can exclude files on the basis of their size or age. In addition, you can use the wildcard fields to specify the file types and folders you don't want to back up. Figure 2: In the Backup Preferences dialog, you can exclude certain files from the backup profile. The Interval between SpiderOak scans drop-down list lets you specify how often the client scans for changes and backs up the modified files. The View section of the SpiderOak client acts as a file browser that you can use to browse backed up directories on all machines linked to your account. The file browser doubles as a download manager, and you can use it to fetch files stored on the other machines. The browser also lets you manage previous versions of files and documents. The browser displays the number of available versions for a specific file next to the file name. When you select the file, the browser shows a list of all its versions in the Historical Versions pane to the right (Figure 3). If you want to download a previous version of the file, select the version you want from the list and press the Download button above the file browser pane. This downloads the selected version to the download directory (which you can set in Preferences | General). The file browser sports another nifty feature called Merge. As the name suggests, it combines the contents of two directories, resolving potential conflicts in the process. To run the merge operation, select the source directory, and press the Merge button. Then use the Merge wizard to select the second source directory and specify an output directory (it will contain the merged contents). Pressing Finish performs the merge operation. Figure 3: The View section provides access to previous versions of the currently selected file. The Share section lets you share files and documents with other users. To enable the sharing feature, you need to specify a unique ShareID (Figure 4). Once you've done that, you can set up a so-called ShareRoom containing the directory you want to share. When creating a ShareRoom, you have to specify a unique share key and select the desired directory. Then press the Start Share button to activate the created ShareRoom. Now you can give the ShareRoom's URL to other users so that they can access the contents of the shared directory via the browser. Figure 4: Setting up sharing in SpiderOak. Finally, SpiderOak can act as a synchronization tool, and the Sync section allows you to create and manage synchronization profiles (Figure 5). Setting up a synchronization profile is as easy as specifying the directories you want to keep in sync. When configuring the profile, you also have the option to exclude certain files from being synchronized. Once the synchronization profile is configured, press the Start Sync button, and Spider Oak takes care of the rest. The ability to keep multiple directories in sync allows you to create rather flexible synchronization rules. For example, you can set up a synchronization profile that syncs the Documents directories between Machine A and Machine B and the Photos directories between machine Machine C and Machine A. Figure 5: Specifying synchronization settings. In addition to the desktop client, SpiderOak provides a web-based interface that you can use to access your data from a web browser (Figure 6). SpiderOak's web interface is not exactly brimming with features, but it does allow you to browse and download files and documents. 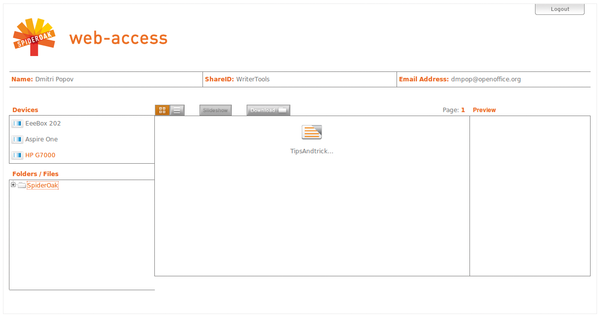 Figure 6: With SpiderOak's web interface, you can access your files via a browser. Of course, it's almost impossible to evaluate SpiderOak without comparing it to Dropbox , another popular synchronization service. So how does SpiderOak stack up against its competitor? Unlike SpiderOak, Dropbox focuses exclusively on synchronization, although it does include sharing capabilities. Dropbox doesn't encrypt the data stored on its servers, which can put off some security-conscious users. Whereas SpiderOak relies heavily on a dedicated client, Dropbox integrates seamlessly into the system. The latter approach provides a more efficient and transparent way of syncing and dealing with files. However, Dropbox uses a single synchronization directory, so any files and folders you that want to keep in sync across multiple machines must reside inside this specific directory. SpiderOak, in turn, can sync as many directories as you want. Dropbox offers better versioning control, making it easier for you to restore deleted files and revert a document to a previous version. SpiderOak's web interface also looks decisively bare bones compared with Dropbox's web-based front end. But SpiderOak offers more storage space and provides a better and more flexible pricing plan. So which service should you choose? If security and backup are your top priorities, then SpiderOak is the way to go. If you are more interested in ease of use and better versioning, Dropbox probably is a better choice. At the end of the day, you might want to use both services. Both SpiderOak and Dropbox offer free accounts, and you can run both clients side by side, taking advantage of the best of both worlds.